The salivary glands has 3 pairs, the contributing functions of this glands is the production of saliva, the 3 glands produce of approximately 1 liter of saliva in a day. These tree glands composes of many lobe that each lobe contains a tiny lobules. The entire gland is connecting on a network of blood vessels and ducts. The nobules has minute ducts, joining the minute duct together forms a tributary which become a large efferent ducts that transport the saliva enzyme from entire gland to the mouth. Calculus - An abnormal formation of calcium salt or mineral salts commonly called as stone. 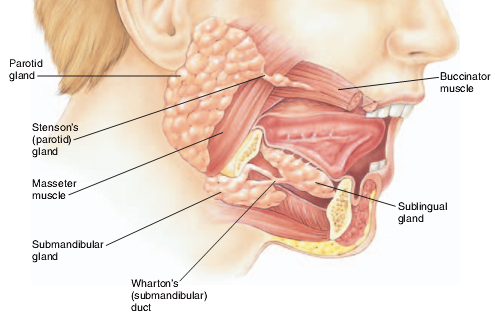 Obstruction or blocked salivary glands - Blockage in the passage of saliva through its ducts. Tumor - Abnormal tissue growth where cell are rapidly increases growth and uncontrolled it is also known as cancer. Infections - Usually it is inflamed or swollen glands and it is usually painfull the cause of this infections is commonly smoking that builds up bacteria. Sialography - Radiographic Examination involving the salivary gland and ducts with the a contrast media oftenly one of the water soluble iodinated contrast media. But sialography is rarely performed because of modern improvements in computed tomography (CT) and MRI (Magnetic Resonance Imaging) techniques. When pathology on salivary a lessions or stone is suspected CT and MRI is the modality of choice. See more on Sialography. Tangetial Projection Parotid Gland - is an x-ray examination of parotid gland with the central ray is perpendicular to image receptor. 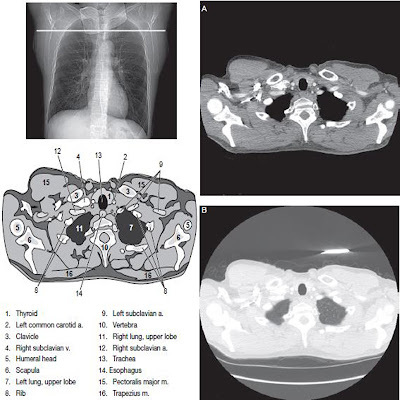 Lateral Projection Parotid and Submandibular Glands - Is an examination of parotid and submandibular glands with the use of x-ray projected laterally. Axial Projection or Intraoral Method - A method uses an occlusal film where patient is instructed to bite the occlusal film.